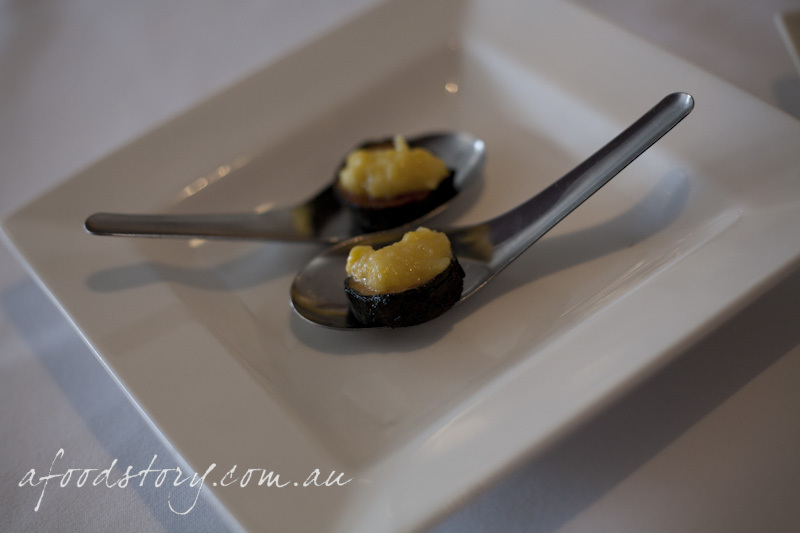 Our host for lunch was Deb Pearce, co-owner, sommelier and wife of Chef Tim Pratt. Deb was one of the friendliest, warm and welcoming maître d’s we have come across, more than happy to have a chat about the restaurant and their produce and evidently passionate about food and the ethical treatment of animals. Scallop mousse nori roll with sweet corn vinaigrette (complimentary). An interesting combination yet a pleasant way to start the meal. The scallop mousse was light yet creamy and the nori lovely and fresh. Dylan’s not a huge fan of nori unless we’re at a top notch Japanese restaurant, but even he commented on its freshness. 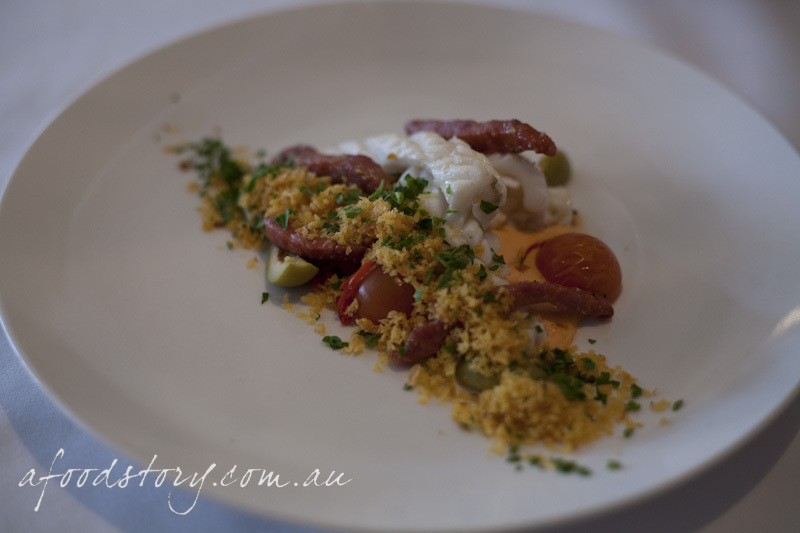 Sautéed calamari with chorizo, chilli, green olive, tomato, rouille and herbed breadcrumbs ($20.50). 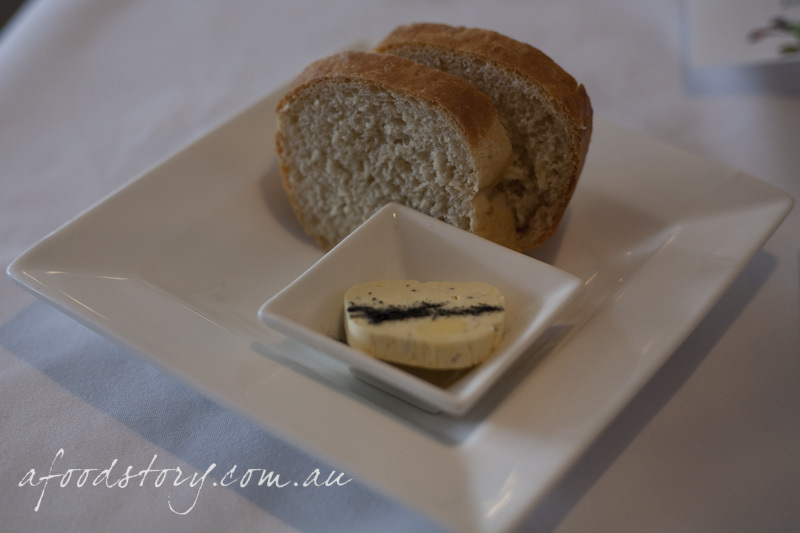 Having started our road trip to Melbourne with a stop at Berry Sourdough Bakery & Café and knowing we were heading to Ottoman Cuisine for dinner we had to restrain ourselves at lunch so we opted to share an entrée. The dish was an unusual combination which both Dylan and I felt was a little ambitious. The olives were overpowering and the calamari underwhelming. The only saving grace was the tasty chorizo. 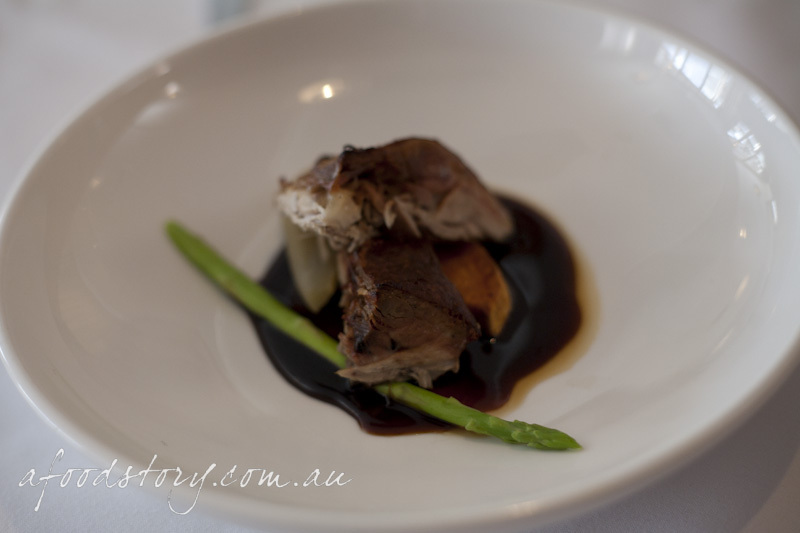 Twice cooked Thirlmere free range duck leg with poached pear, asparagus, kumera and a master stock and sesame sauce ($39.50). I used to shy away from duck, too fatty, nothing special, just not me… and then I discovered properly cooked duck with beautifully rendered fat, crispy skin and tender meat… and now I can’t resist it. The twice cooked Thirlmere free range duck leg was unbelievable, the master stock delicious and the sticky sesame sauce was gorgeous. I had been tossing up between this dish and several others on the menu but I was not disappointed with my final decision. 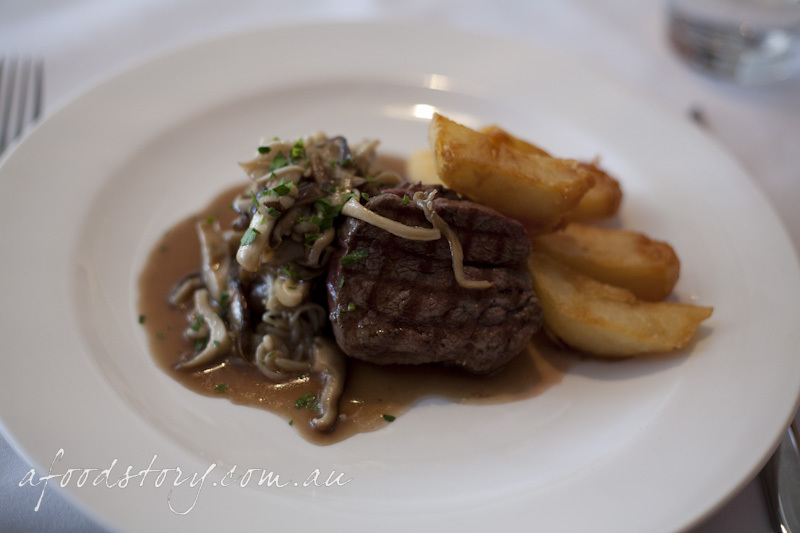 Eye fillet 200g with hand-cut fat potato chips and mushroom jus ($37.00). It was refreshing to see grass fed beef on the menu and Dylan’s only decision was which cut of beef to have. He settled on the 200g eye fillet which was superbly cooked to order and accompanied by mixed mushrooms and hand-cut fat potato chips which did not disappoint. I can only describe the chips in one way – out of this world. The ideal chip, crunchy on the outside, soft and fluffy on the inside, I could have eaten a whole bowl! Salad of mixed leaves (complimentary). 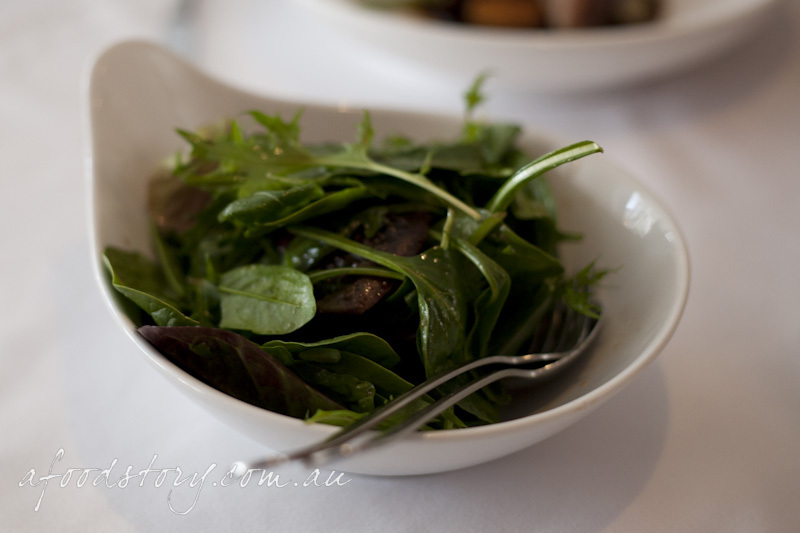 Another nice touch was the complimentary salad of mixed leaves with a light dressing. 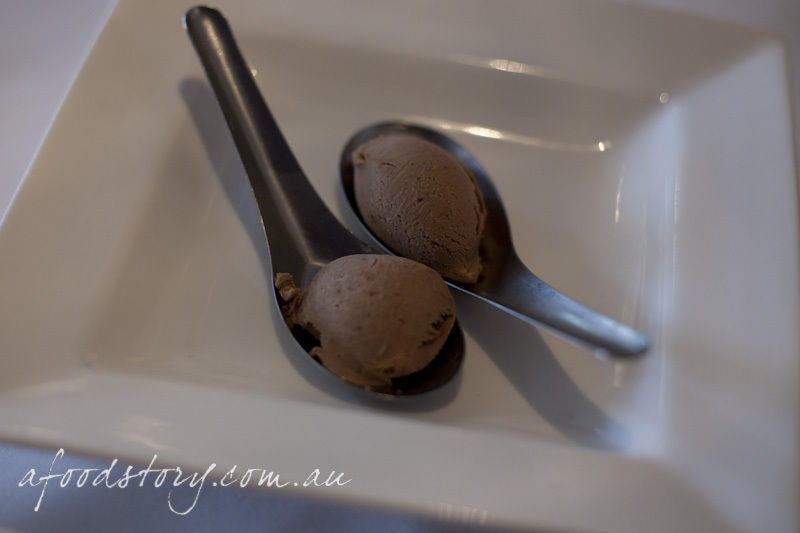 Chocolate, cinnamon and chilli ice cream (complimentary). Although I was dying to have dessert I had to decline otherwise I’d never make it to dinner; but the complimentary chocolate, cinnamon and chilli ice cream was the perfect serving size and totally divine. I was expecting a punch with the chilli but it was quite subtle and let the creaminess of the chocolate do the talking. Macchiato, chocolate fudge and walnut and orange biscotti. Is there anything better than a macchiato to finish a meal? How about a macchiato with a little piece of fudge and biscotti? Yum! So much for restraining ourselves at lunch, we came away from the Journeyman having eaten much more than anticipated but with no regrets. It’s sad to see a month after our visit the Journeyman Restaurant has closed its doors. 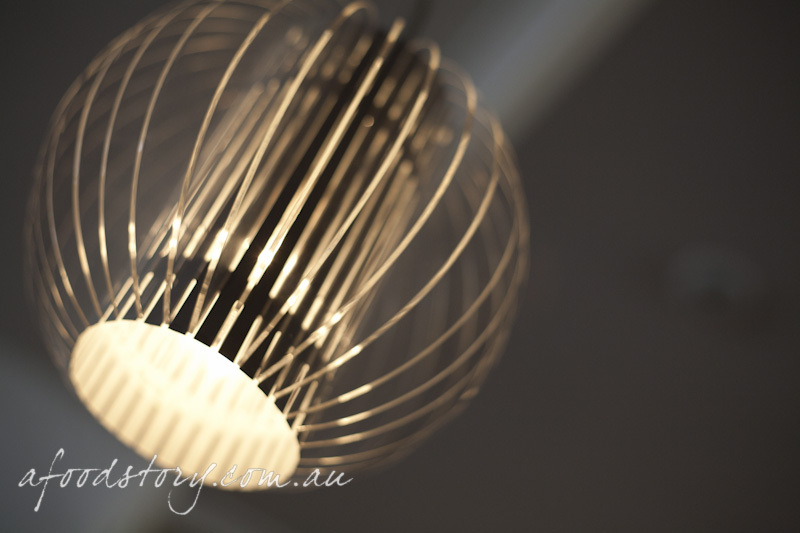 The food was fresh and flavoursome, the service warm and knowledgeable and the attention to detail was comparable to fine dining restaurants in Sydney, right down to the cotton hand towels and hand cream in the bathrooms (it’s the little things a girl loves!). We wish Tim, Deb and the team all the best in their next adventure and only wish we had the opportunity to dine at the Journeyman again. I feel sad that I was not able to discover this awesome place when it was still open. Their food looks delicious, not to mention the way they present their food to their costumers.